First Thursdays at Pioneer Square! You are invited to visit my artist studio every First Thursday to see a new show of original artwork. My new studio locations are a part of the Pioneer Square First Thursday Art Walk. Every first Thursday 5pm-8pm (and more like 4pm-9pm). The art will be different every month so come every month. - Sept: "Robots Are People Too!" - Robots, what more can I say! If you can't make it on a First Thursday, you can come on a weekend (provided I am not working an art fair somewhere else) or contact me to visit by appointment. My Summer 2018 Original Art Catalog is now available; Click here! My Spring 2018 Catalog of Original Art is now available. Here is a behind-the-scenes peek on how my painting "Cube of Hearts" came to be. 1. In the beginning, a lot of random abstract marks on a canvas. Doesn't look like much at this stage, and could turn into anything. I strengthen certain lines looking for patterns. 2. I keep painting randomly on it, trying to see where it goes. Busier and Messier. Which way is up? I turn the painting upside down and wonder: Is that a face on the top right quadrant and a cat in the bottom right quadrant. Maybe a monster of two? 4. I decided there is a hunched figure squatting in the foreground, and the cat in the bottom right is really more of a fox, given the bushy tail. I paint over the face to create a faceless blob. Maybe that'll be a creature of some kind. 5. I try to refine the figure, but realize it isn't working. At this point I get stuck. I feel this painting isn't working and it's looking pretty un-aesthetic - not sure I can resuscitate it, Maybe the experiment is doomed for failure. I put it away. 6. Six months later I put it back on the easel. I like the figure, I like the fox, I like the sky. Maybe I can do something with it after all. First thing I decide is that the figure is not going to be sitting, but floating. And if the figure is floating, better it floats, not over ground, but over clouds. Pink clouds. I'm so partial to pink clouds. The figure needs to be blue, to contrast the pink. and if the figure is blue, then the background needs to be orange to 'pop' the figure. And since the sky is blue, that'll tie the figure to the background, making the painting cohesive. And since the clouds are 'cool' that'll bring them to the front of the 'hot' orange background. Maybe this will work after all! Hope you enjoyed this behind-the-scenes peek! Note: All the images above are 'To Scale', relative to each other. I accept commissions for paintings that are aligned to my whimsical vision and style. ​"Birds of a Feather", Oil on Panel, 8" x 8"
"Drinking Buddies", Oil on Panel, 8" x 8"
Client commissioned a painting based on a previous original painting titled 'Drinking Buddies' but this time with a purple background and featuring both her husband and her dog. 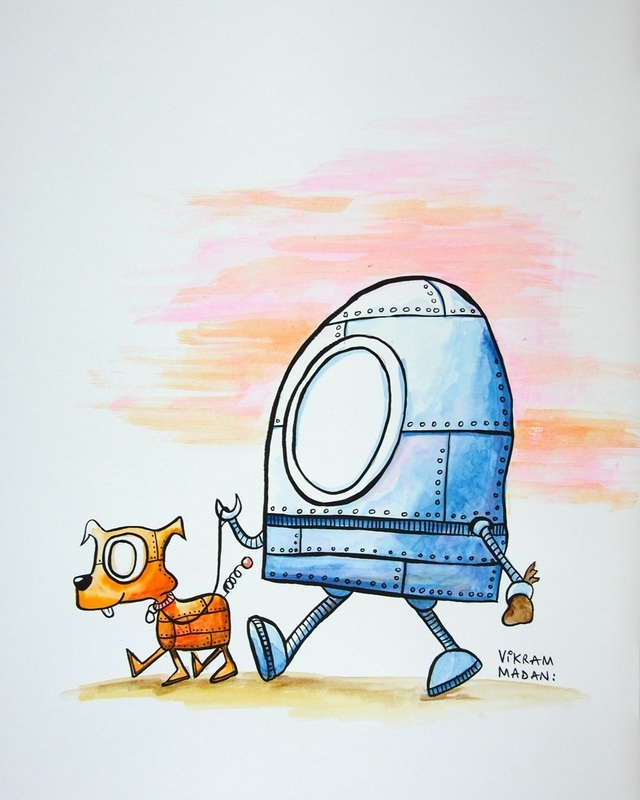 "Frog Wash" & "Frog Rider" - Acrylic on Canvas, 16" x 12"
"Walking the Dogs", Ink and Watercolor, 12" x 16"
Inspired by my original sketch featuring a robot walking a dog, client commissioned a painting that would include the client's partner and both their dogs. "Oh, The Places You Will Go" - Acrylic on Canvas, 16" x 20"
Client commissioned a painting to be presented to their graduating child to mark the occasion as the child launched off into their new life. "Billy-Idol-Bot", Ink on Panel, 6"x6"
Client wanted to commission a small Robot-themed Ink-On-Panel painting for her friend with a Billy Idol (musician) theme commemorating the concert they attended together once-upon-a-time. Exact quote will depend on the complexity of the project, whether the painting will be in oils or acrylics, how much research & preparation time the project requires, how urgently you want it completed, and how much the commission will disrupt all my other ongoing projects :). Exact quote could be more or less than the above guideline ranges. Frames are not included in the commission price, unless I tell you otherwise. State sales tax will apply for WA state residents. Oil paintings typically cost more than acrylic paintings. * Half-payment up front to initiate project. * Upon completion of project, you can choose whether to accept the finished piece or not. * If you choose to accept the finished piece, remaining half-payment is due on delivery. * If you choose not to accept the finished piece (because you changed your mind or you didn't like how it turned out), no payment is due and you can walk away from the piece, but the first half payment will not be refunded (it compensates artist for time and materials consumed) and artist will retain the finished piece. * Any studies or intermediate works generated in the process of creating the piece are property of the artist and not part of the transaction. For commissions to recreate one of my previously-sold paintings or other designs, please note that painting is an organic process full of 'happy accidents' and while I will try my best, it is more than likely that the finished piece will differ from it's predecessor. Some variation is inevitable, and should be welcomed as it ensures the commissioned piece will be truly unique. To initiate a conversation about a commission, start by sending me an email. Please note that I reserve the right to decline your commission proposal if I conclude it does not align with my artistic direction and vision. I will let you know up front before you commit yourself. ​Here is a link to my latest quarterly Artist Newsletter dated Nov 2017.